Description: Limited edition watch packaged with certain preorders from Amazon. 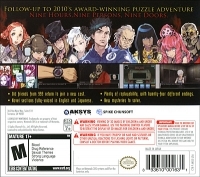 Box Text: Follow-up to 2010's award-winning puzzle adventure Nine Hours, Nine Persons, Nine Doors. *Old friends from 999 return to join a new cast. *Plenty of replayability, with twenty-four different endings. *Novel sections full-voiced in English and Japanese. 11-10-2015 silverbow Box Text Follow-up to 2010's award-winning puzzle adventure Nine Hours, Nine Persons, Nine Doors. *Old friends from 999 return to join a new cast. *Plenty of replayability, with twenty-four different endings. *Novel sections full-voiced in English and Japanese. *New mysteries to solve. 10-31-2012 desocietas Box Text Follow-up to 2010's award-winning puzzle adventure Nine Hours, Nine Persons, Nine Doors. *Old friends from 999 return to join a new cast. *Plenty of replayability, with twenty-four different endings. *Novel sections full-voiced in English and Japanese. *New mysteries to solve. 10-29-2012 desocietas Description Limited edition watch packaged with certain preorders from Amazon. This is a list of VGCollect users who have Zero Escape: Virtue's Last Reward in their Collection. This is a list of VGCollect users who have Zero Escape: Virtue's Last Reward in their Sell List. 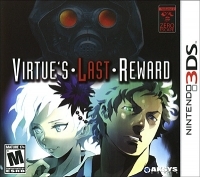 This is a list of VGCollect users who have Zero Escape: Virtue's Last Reward in their Wish List.